Known for giving the classic roasted turkey a local spin, the newest rendition features the bird marinated overnight in a mixture of fresh lemongrass, turmeric, galangal, cumin and coriander powders, as well as the chef’s secret spices. It’s then slow-roasted for hours, ensuring that the skin remains tender while the skin has a caramelised and slightly charred exterior. Best have it with the housemade ground peanut dip, and, of course the rice cakes, onions and cucumber slices. Available from November 5 to December 25. For enquiries and orders, please call 6559 6796 or email thesalon@hfcsingapore.com. There’s no controversy about this rendang creation, courtesy of executive chef Bryce Li. The turkey is soaked in a blend of Indian herbs and spices including ginger, galangal, lemongrass and turmeric leaves for hours, before it’s cooked to perfection with the meat still moist. It comes with chestnut begedil (patties) and a piquant marinade of (more!) Malay and Indian spices. Available for lunch and dinner from December 15 to 31. For enquiries and reservations, please call 6739 6565 or email orchardcafe.ohs@millenniumhotels.com. 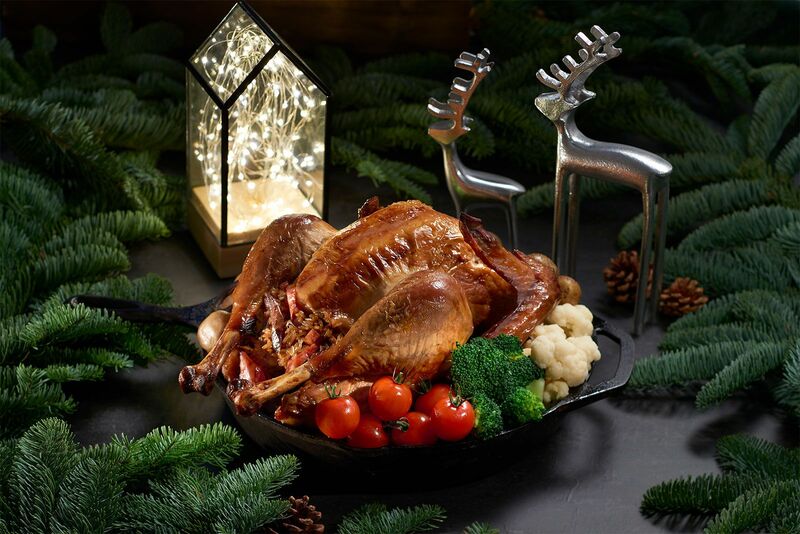 Now, this is a truly unique creation which deserves the main spot on your dining table this Christmas. Executive chef Peter Birks makes it by laboriously stripping the meat off the bone, stuffing it with fennel pollen, prosciutto, sage, pecorino and parmigiano reggiano, and rolling it like a porchetta (hence, the name). It's then cooked sous vide, then oven roasted to ensure it's juicy with a crisp skin. Served with a tangy cranberry and pineapple salsa. Available as part of the festive menu on December 24. For enquiries and reservations, please call 6688 8522 or email NC_Reservations@marinabaysands.com. The beauty about food is that there are no culinary boundaries. Just look at this invention by chef Jack Chai, which gives this classic favourite an oriental twist. The meat is soaked in a mixture mostly made of heady roasted garlic and smashed raw garlic cloves. It’s then stuffed with stir-fried rice tossed with bits of Chinese sausages. Served with baby carrots, cherry tomatoes, cauliflower, button mushrooms, brussels sprouts and baby potatoes. Available from November 19 to December 27. For orders and enquiries, please visit www.peachgardeneshop.com. Need some spice in your turkey? Executive chef Pramote’s creation will give you that and more. The poultry is steeped in a concoction of secret herbs and spices, which infuses all the goodness from the crisp skin to the exquisitely moist meat. But the real winner is the housemade sweet-savoury sauce, which comes in red, green, panang curry, basil and chilli flavours and complement the meat. Available from December 10 to 31. For orders and enquiries, please call 6222 4688 or email thanyingrestaurant@amaraholdings.com.